SDA is buzzing these days and if you haven’t headed here on a Saturday night recently, it’s time you checked into these places. On the downside, Mr Sub’s gone. But a massive Sugar & Spice has opened in its place and it’s perfect for a quick coffee. We know if you’ve lived in Delhi for a while, chances are you’ve encountered Sugar & Spice at some point. This outlet however comes as an upgrade. Spread across two floors, it’s done up in red bricks, cute art on the walls and pista green chairs. Perfect for an intimate coffee date, we think. Hungry? They have two huge displays full of sugary as well as savoury treats. Choose from bakery fare such as cinnamon rolls, pastries, chicken puffs, pesto sandwiches and an unusual chocolate eclair – they’ve given the usual whipped cream a miss and filled it up with a strong coffee cream. There’s also an outdoor area upstairs complete with wooden vintage-y chairs and money plants, overlooking a sea of happy faces synonymous with the market. 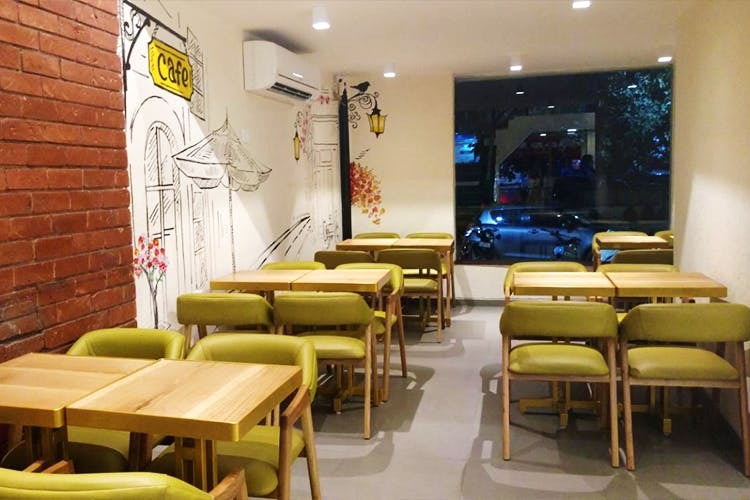 Whether you’re looking for a place where you can hold hands with bae and sip on a hot cuppa or just need that shot of espresso after a long night of partying at SDA, Sugar & Spice is bound to come to the rescue. We wouldn’t however recommend going here for a full meal.